Zounds, I was just dreaming I was interviewing Leonard Bernstein. I was asking him what his recollections were of Leonard Pennario because Pennario and he knew each other slightly and Pennario played Bernstein's "The Age of Anxiety." I love how when you dream you usually have all your facts straight. And in my dream, I had all this straight. When I remember my interview it made perfect sense. Now that I am awake and no longer interviewing Leonard Bernstein, I am thinking of running off to the Clinton-Bailey Market. I have to make the family Easter dinner and I have not even begun to prepare. Above is a picture of the Clinton Bailey Market in autumn that I found on Google. My friend the photographer Charlie Lewis took the picture. It is from The Buffalo News. 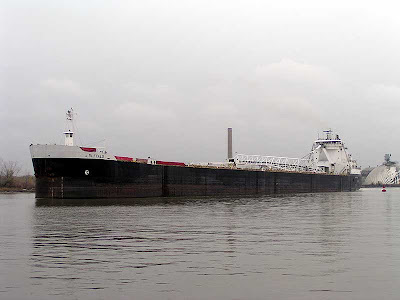 While I was looking for pictures of the market I also found this cool picture of a Great Lakes ship called the Buffalo. It is bringing in supplies for my Easter dinner! My brother George tells me that at the Clinton-Bailey Market they are already selling stuff. I am not sure what. Nothing is growing here yet. That is for sure. Well, my chives are up! And remember that goofy sorrel that I planted a few years ago? That is back too. That was almost exactly a year ago I wrote about that sorrel! I have already bought most of my food for Easter. I am holding the family Easter dinner. But there is always something more I can buy and you know me, I love my food shopping! Which, the other day something terrible happened to me on Facebook. On Facebook you are supposed to report now and then what you are up to. And I tossed something dumb up there that looking back I see I should have worded more carefully. 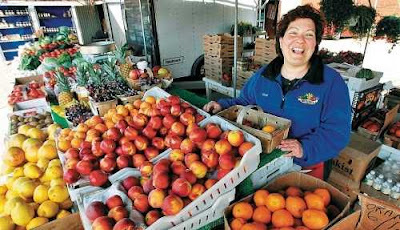 MARY KUNZ GOLDMAN went to Aldi's and felt so unclean! This columnist I used to love, Mike Royko, he hated that place and said they were mean to their workers. How low will I go for 79-cent cream cheese...? So, I write that, and then I go off to cook dinner and have a glass of wine. I come back a while later and I could not believe it! There were something like 20 comments!! Mean things! Sorry that shopping at Aldi's and Walmart is so beneath you... Maybe the "unwashed millions" do, becasue they have to. How did Walmart come into the picture? Then someone picks a fight by chiming in, "The Broadway Market is filthy." Someone else starts raging against that guy. "When was the last time you were there?" Meanwhile a few of my friends were chivalrous enough to get up there and start defending me. My friend Michelle did that. She is named for St. Michael the Archangel which is why she defends me in battle. 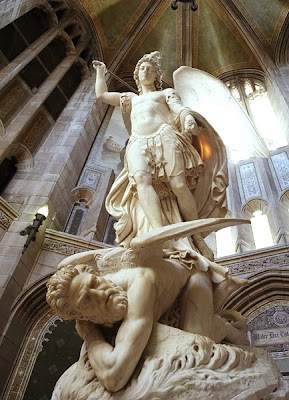 Here is a beautiful statue of St. Michael the Archangel dealing with an enemy of God the way Michelle deals with meanies who post nasty comments on stuff that I write. Everyone, I am looking over these messages and I think some people misunderstood "unclean" to mean physically unclean... I didn't mean it that way! I meant it as in "guilty." Let's let this drop. Move along, everyone! Carl, your message cracked me up. On account of Carl had written something about ... I cannot write what Carl wrote, this being a family Web log. And then the argument raged on! For about 20 more comments, each one more frightening than the last! This is what happens in Buffalo when you write about food. Note to out-of-towners: In Buffalo we do not take our food shopping lightly. In Buffalo, it is serious business! I am most honored to be in the company of St Michael! :)! I'll defend you too, just because you started with the word "Zounds."